Let me explain a little. There are twelve of us, a happy little group with a passion for bread baking. What we share is a love for fun, baking bread and doing so together. Across country, across boundaries, across the internet. We are about the new coffee klatch in our virtual kitchens, the new over-the-fence talk taking place on the Internet, sharing knowledge, helping each other out. The modern kitchen table may look just like grandma’s except for that laptop sitting next to the coffee cup. Through the magic of Instant Messaging and Skype all of us are chatting over coffee at the kitchen table, baking bread. All our different houses, all our different kitchen tables, same group. You know; a bit like these communities in earlier Europe where all the women of the village bake their bread on one day, share the communal oven, meet at the hearth, gossip and teach each other, sharing their knowledge. Some of us have known each other for different times; some of us have even met in person. 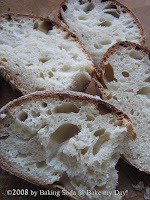 Our experience with bread baking may vary but we all share a great passion and fascination for bread at the moment. And so once a month you can find us together in one of our kitchens: yakking, baking and laughing. 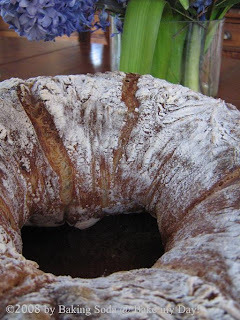 Same recipe, different kitchens, using local flour and sharing what we found. You can read all about our monthly recipe at the Kitchen of the Month, our individual posts to be found at our respective personal blogs. A Fridge Full of Food (Glenna, Alumni Babe), Bake My Day (Karen), Cookie Baker Lynn (Lynn), I Like to Cook (Sara), Living on Bread and Water (Monique), Lucullian Delights (Ilva), My Kitchen in Half Cups (Tanna), Notitie van Lien (Lien), The Sour Dough (Mary aka Breadchick), Thyme of Cooking (Katie), Canela and Comino (Gretchen). We remember Sher at What Did You Eat (our Angel Babe, we miss her). 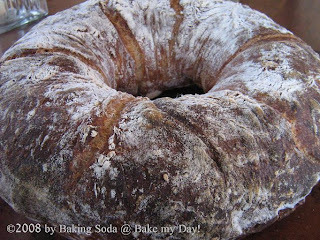 Our first combined effort is a bread in the "wet dough spectrum"; specifically the Royal Crown Tortano. (Recipe Maggie Glezer’s Artisan Baking) Characteristics of this bread are: a mild pre-ferment, the addition of a small amount of potato in the dough, very very long rising time but little handling of the dough, using the tiniest amount of yeast to produce a deep dark brown crusty loaf of bread. The time required for this recipe: 19 hours.....effectively 20 minutes of active work. My kitchen was Kitchen of the Month February and I am supposed to give you the full recipe here. But... I don't want to discourage you with an even lengthier post so you can find the recipe in English at Mary's. I've made this bread several times before and already posted the recipe in Dutch and talked about the bread here and here. You'd like a slice? Visit our Kitchens! It's warm and comfy in here, have a seat. I baked this bread over two years ago and it was a real challenge. Congrats ! bread baking babes! what a great idea! love it, cant wait to see what you babes bake! Your bread came out wonderfully! I love all the huge holes. Isn't that funny? As a cake maker I'm usually pleased when there's a small uniform crumb, but this time I'm gleefully looking at "holes"!!!! Karen, you were the hostess with the mostest this month! Not to mention, I love that you keep a bottle of wine at the ready for us any time we drop by!! 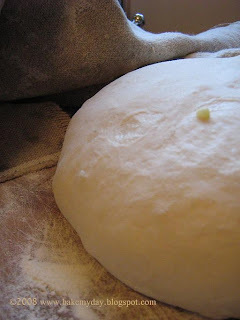 The bread recipe was wonderful and guess what is raising in the oven right now? Yup, loaf #3 of the month. Thanks for such a great recipe. Yes, Ulrike, I've seen yours at the time, what I really like is to see how flour, water, yeast and salt in the same recipe turns out breads that are alike and still bear the baker's signature! Thanks Myriam, you're welcome to my kitchen anytime! Glenna, I hear you on the holes, isn't that funny? Mary.. I'm hoarding some left over potatoes right now.. Thanks for this fun and challenging bread experience. I'm definitely going to be making it again. Karen I don't know how to tell you what fun you, everybody in the group and baking bread with you is. I'm looking forward to many times in the kitchen (many kitchens) and many more breads. This was really a wonderful wonderful recipe. Poor in the coffee , Babe , 'cause I'm coming to sit on your kitchentable ,soon. And not virtual like we did in BBB's.Did you have a virtual kitchen clean-up before we all stumbled in ? Beautiful bread, what did those beautiful holes tasted like ? Heaven ? So the first one is launched, hoorah! Thanks for everything dear Karen, the invite to start with, the great recipe and hosting in your cosy kitchen. You bread is wonderful, as always. Just wanted to ask did you bake it on the round stone dish? Or didn't that fit? What a wonderful hosting kitchen! First time at your blog and I am intrigued. Hope to be back soon! great job on this bread, looks beautiful. I especially like the light coming thru the bread shot! Klinkt goed: Bread Baking Babes! Ik ben benieuwd naar welke broden jullie allemaal gaan bakken. Het begint in ieder geval goed met deze prachtige Royal Crown Tortano. Your bread looks wonderful inside and out. I love being part of the group already! Your bread looks so beautiful! 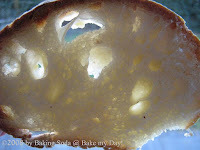 I love the photos of the crumb and all the holes. Lovely! This is a very beautiful blog. And a very useful article. Thank you for sharing..